Our 2 bedroom cottage sleeps up to 4 people in one double and one twin room. The cottage has a fully fitted open plan kitchen, a large living-dining room and a toilette-shower room. The cottage has a flat screen TV, full central heating and its own front and rear garden areas. The cottage is sited on a 2 acre site, which has its own fishing lake with free fishing for our guests. Also on the site is a 6 berth static caravan for rent and a 5 caravan touring site, licensed by the Camping & Caravan Club. Our Mature Fishing Lake is well stocked with Roach, Bream, Rudd, Tench, Golden Orfe and a variety of Carp, which includes Commons, Mirrors, Koi, Ghost and Grass Carp. All pegs are level and easily accessible and are only a few feet away from your chosen accommodation. A complimentary, secure tackle shed is provided with bait fridge, storage and drying area. Fishing is allowed dawn till dusk. ( sorry no night fishing ) NB. Barbless hooks only to be used sorry No Boilies, No Keep Nets. 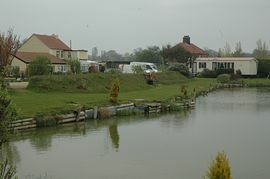 National Rod Licence Required. Weekends and bank holidays food and drink is available on site. Green Haven is situated on the outskirts of the Village of Friskney on the A52. We are approximately 7 miles south of Skegness and 15 Miles North of Boston. The site is well signposted on the roadside. Weekly tariff's from: £270 a week low season, up to £410 a week high season (2011 prices). 2010 prices approx 10% cheaper. Open virtually all year apart from 3 weeks in November and 2 Weeks in February. The cottage is available from 2pm on your arrival day, and should be vacated by 10am on your departure day. Children under 14 welcome but need to be supervised at all times. Fishing pegs can be reserved each day by our guests. Green Haven is a place where guests become friends. Customer comment books are available for inspections and many guests book year after year at Green Haven.